Gibsons Wildlife Rehabilitation Centre hasn't added a story. Gibsons Wildlife Rehabilitation Centre is a registered Non-Profit Society that has been in existence for nearly 30 years, and is run by Clint and Irene Davy out of their own home. They take into care hundreds of sick, injured and orphaned wildlife every year, both birds and mammals, from hummingbirds to Great Blue Herons, baby squirrels and raccoons to fawns. Food, medical supplies, medications, veterinary care and other essentials needed to keep each creature clean and warm are always provided, but all of these costs keep rising. In addition, the existing enclosures and aviaries are now, after all these years, in need of renovation. Gibsons Wildlife Rehabilitation Centre receives absolutely no Federal or Provincial funding, and relies entirely on donations, so we are making a very special appeal now so that this vital care for our native wildlife on the Sunshine Coast can continue. We need a dedicated building to house the wildlife, so that we can move the birds and mammals that come into care, from the Davy’s home into a new facility, prior to transfer into the outdoor aviaries and pens, and eventual release. We are hoping that our community will respond, and enable us to purchase a used commercial trailer that can be adapted to serve the purpose, and, in addition, allow us to equip the building with new cages to house the birds and animals that need care until they can be released back into their natural habitat. Our goal is to raise $25,000 in order to make this dream a reality. All donations, large and small, will be so gratefully received, and will directly help to ensure that Gibsons Wildlife Rehabilitation Centre can continue in its mission to give every wild creature a second chance. Gibsons Wildlife Rehabilitation Centre hasn't posted any updates yet. Gibsons Wildlife Rehabilitation Centre is managing the funds for this campaign. 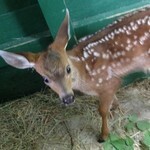 Gibsons Wildlife Rehabilitation Centre is a verified organization.